When I signed up for the Ocean Sports trip to Cozumel in January 2011 it was with reservation. I wasn’t even an open water diver yet and had never travelled alone before. I worried about getting there safely, not knowing anybody else, whether I’d remember the skills I’d practiced in the pool… you name it and I worried about it. Turns out all that worrying was a waste of my time! Most of the divers were repeaters and have known each other for years, but they couldn’t have been more welcoming to those of us new to the trip and to diving. I’ve never felt quite as included as I did at the Blue Angel with Kari & Matthew and the rest of the group. And not only did I get to hang out with a bunch of awesome people for a week, I also got to bring those new friendships back to Edmonton with me! Kari & Matthew took excellent care of me, a newly certified and wide-eyed diver. Their professionalism and knowledge impressed me while their obvious love of teaching and diving inspired me. 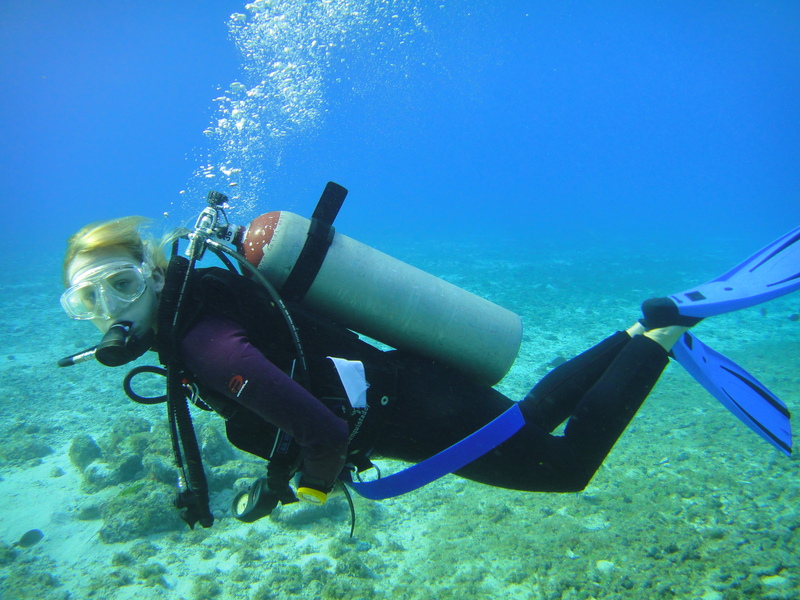 I did most of my training with Kari and dive master candidate Debbie and those girls really had my back – I always felt safe. And, just as importantly, they were great role models. Even when they weren’t actively teaching me skills just watching them dive – how they moved, how they interacted with each other and the environment – was a lesson in itself. 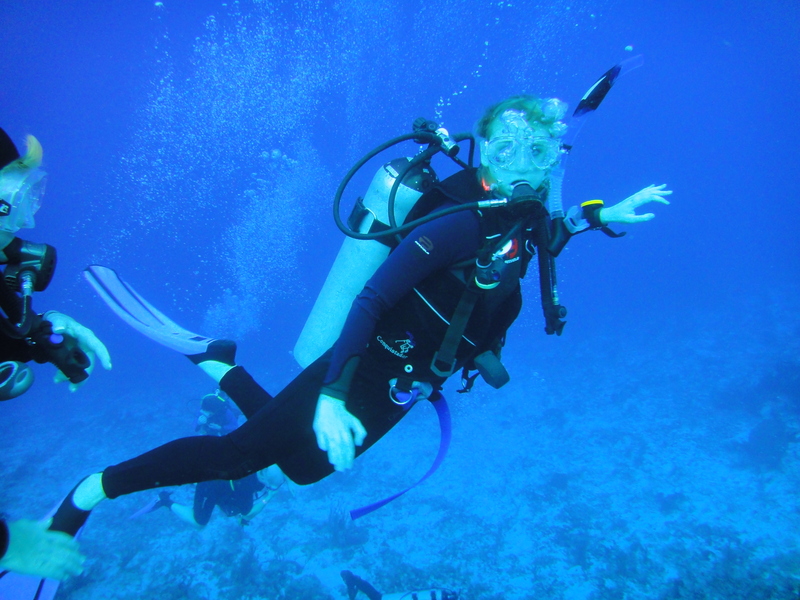 Learning to dive has enriched my life in ways I was totally unprepared for. It’s given me an entirely new and fresh outlook on life and created so many exciting opportunities for travel, adventure, and personal growth. It didn’t hurt that in addition to fantastic diving and new friends, the food at Blue Angel was incredible. And the drinks… and the staff… and the view… you see a theme here right?? I can’t imagine a better place to have gone than Cozumel, or a better group of people to have gone with. There’s good reason they all keep going back and I can’t wait to be among the ‘repeaters’ next year! Amy at the end of the week! Thank you to Amy for recounting her experience, and Congratulations on completing Open Water and Advanced Open Water training! We were so happy to be involved in supporting her first efforts as a diver, and look forward to a continuing relationship! 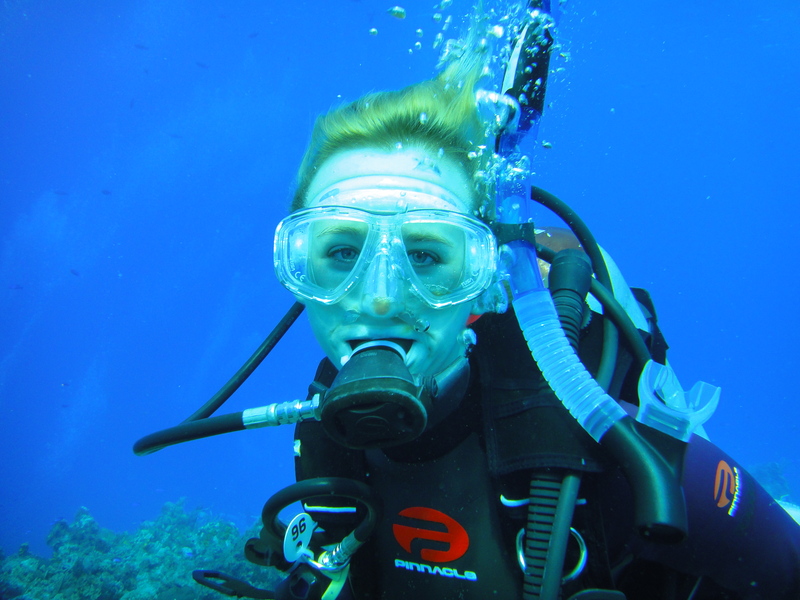 This entry was posted in AtkinsScuba offers Congratulations!, Blue Angel, Kari Taylor Atkins, Matthew Atkins, Ocean Sports, PADI. Bookmark the permalink.